Both Laura and I are very impressed by Arthur Brown's music and presence, and as soon as we'd learned that he'd be playing in Verviers, Belgium, we went out to buy tickets. Apparently there was no need (and hardly possibility) for that at all, as the people at the venue told us by phone. "Just come over, there'll be plenty of room for you!" So we just went. Verviers is about 300 kilometers from where we live in the Netherlands. Arthur Brown and Nick Pynn would play on Saturday (27 May), so we decided to stay the weekend. There was so much rain that we decided to not use the tent but rent a small wooden house on the camping instead. Only on Saturday during the day the rain stopped for a while. Sunday, the day we left, the weather was beautiful. The Spirit Of 66 is in the centre of the city Verviers, a small, friendly and comfortable place. I counted around sixty people there, including staff and the musicians from the opening shows. There were two openers, first around half past eight The Michel Drucker Experience, a Belgian band centered around the guitarist, and after that there was The Last Supper, who made so much noise that hardly anybody could hear what exactly they were doing. Well. Around eleven o'clock Nick Pynn took to the stage and played a solo, introducing Arthur Brown. He entered the stage with the black hood around his face, large staff in hand. The first song was A Hard Rain's A-Gonna Fall. After that he took off the hood and his long cloak, and showed his glitter-suit (there were even glitters on his shoes). 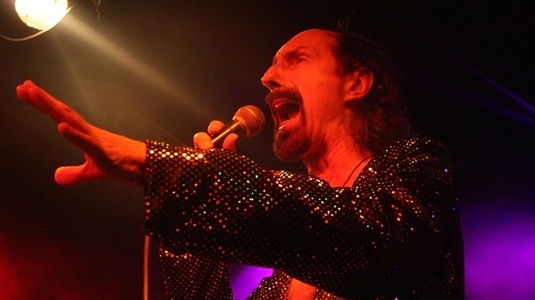 While Nick Pynn was busy sampling his own playing of the guitar and violin (and thus playing the instruments simultaneously), Arthur Brown was dancing, screaming, smoothly singing, well... it's really amazing that after about forty years of performing he still has that enormous voice left...! During some songs Nick Pynn played a theremin, some sort of violin without the stick I'd say, that was lying on his lap while he played it. At one point during the set Brown said: "Now is the time to introduce the band to you... on guitar, Nick Pynn! 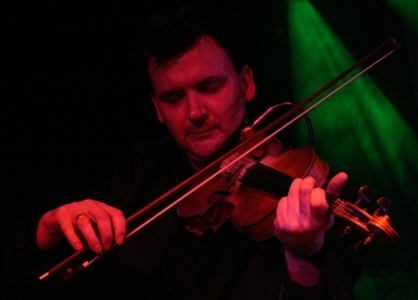 [applause] On violin, Nick Pynn! [applause] On theremin, Nick Pynn! [applause]" etcetera. 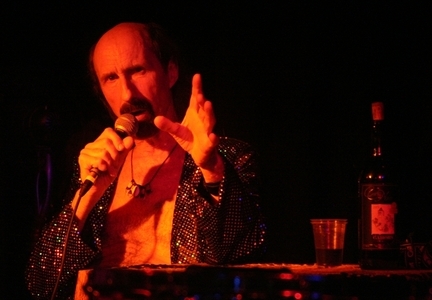 Arthur Brown in Verviers, 27 May 2006 (unknown photographer). Nick Pynn in Verviers, 27 May 2006 (unknown photographer). Around one o'clock the set was finished, after about one-and-a-half or two hours of Arthur Brown music. I talked to Nick Pynn some time while he was packing his stuff on stage, and he said he regretted not having seen more of the beautiful nature around Verviers (the forest, the brooks and rivers), but they had to be in Bremen the next day. "I think I'll have me an early breakfast," he said. Around two o'clock Arthur Brown walked off the stage into what was left of the audience. He had to sign many autographs and pose for many pictures, and he seemed to like everything just as much. Never annoyed, never irritated, always smiling, always calm. I am glad for having chatted some time with him. He is a remarkable person, and appears to be very loveable and warm (if those are the correct words in English). He told me that he had indeed performed in the Netherlands, but that was "in the old days," and he remembered having played in Paradiso and the Milky Way (Melkweg), both venues in Amsterdam. There were around six of his albums on sale, the Kingdom Come album, Galactic Zoo Dossier, Brown Black & Blue and some more, and also a solo-album by Nick Pynn, Afterplanesman. He told me that Arthur Brown had contributed a spoken word performance to it and that all songs on it were written by himself (Pynn). I really wanted to buy a God-Of-Hellfire T-shirt, which they needed to fetch for me from some suitcase from behind the stage. I returned to the camping tired, proud and enchanted.